the 100 µm scale bar applies to the other (LM) figures. Figs. 1-4, 6-12. Various morphologies of Tholospironium cervicorne. Most important differences include the thickness of bars, the overall shape, and the presence of a pore-plate, which is apparently linked to the ovoid shape (e.g. figs. 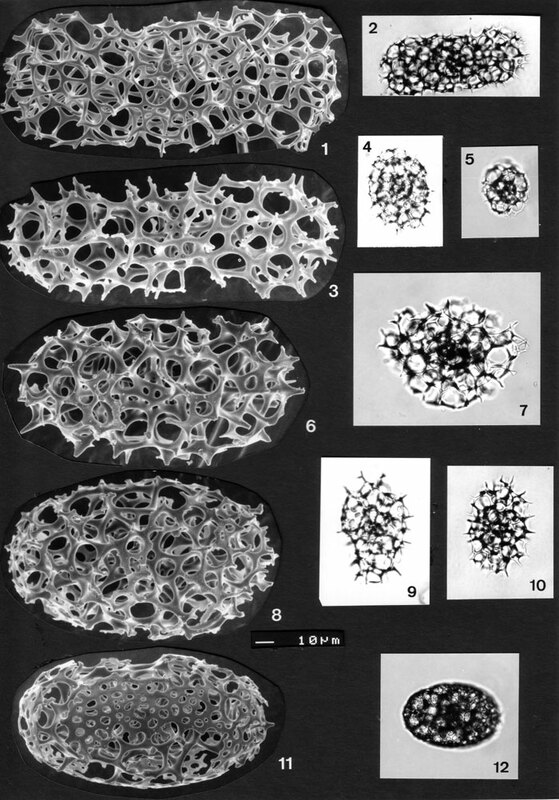 6, 8, 11 and 12, all of which have a pore-plate in varying degrees of development). The relative size of the pore in the pore-plate may also vary considerably (compare fig. 11 with pl. 53 figs. 8 and 14). The pylonid microsphere is visible in figs. 3 and 6. BSS 28B(VII/1487), IOW 134(F), BSS 28B(III/59), BSS 21B(F) EF B28; BSS 28B(VII/1466), BSS 150B(F) EF C27, BSS 28B(VII/1467), IOW 134(F), IOW 134(F), BSS 28B(VII/1130). BSS 38B(F) EF U43. Figs. 5. Pylonid gen. et sp. indet. BSS 21B(F) EF C27.